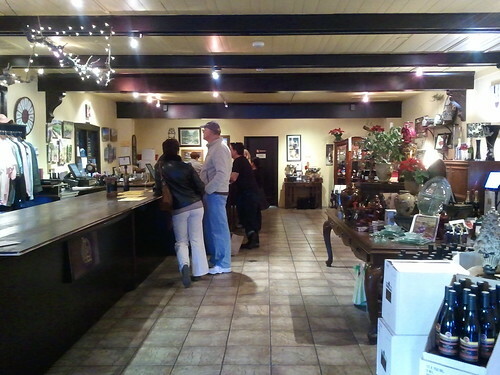 Deciding you’re done tasting is something of a challenge in Solvang. 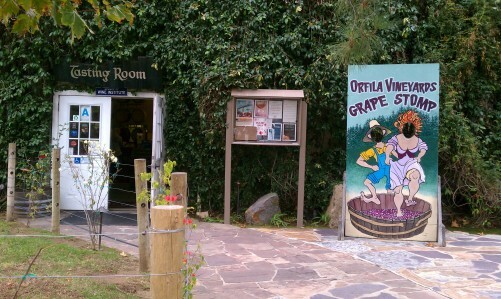 There’s always one more tasting room enticing you to taste a little more, one more place that comes highly recommended. It can be hard to resist. 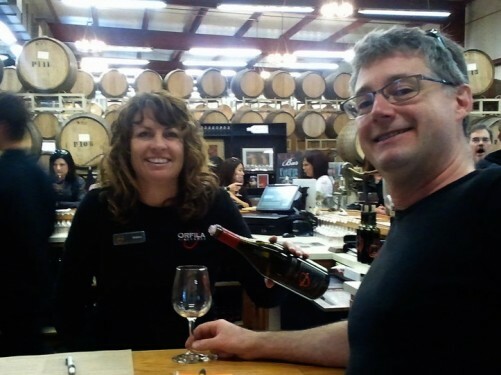 If tasting in Solvang teaches you anything, it’s that the folks here make incredible wine and it would be a shame to miss any of it. That’s how we wound up ending our day at Dascomb Cellars. We had pretty much decided we were done, but we had received a strong recommendation while we were at Lucas and Lewellen. Dascomb was mere steps away, so we decided to tough it out (sigh) and pay them a visit. We’re glad we did. Our pourer (whose name I shamefully failed to put in my notes) was charming and shared her deep knowledge of the area, its history as a winemaking region and the history of the Dascomb family. The Dascomb family planted the area in 1974. 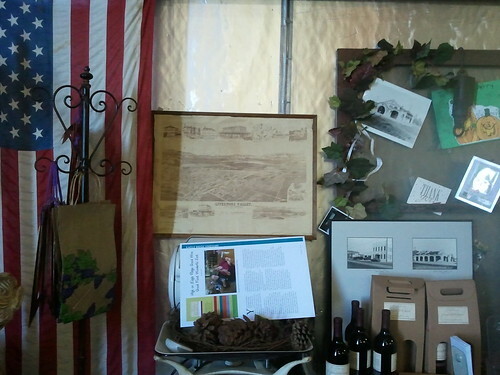 The winemaker grew up on the vineyard, and crafting these wines has been a lifelong passion. The valleys in the larger growing region are unusual in that they are traverse – that is, they run east-west instead of north-south. 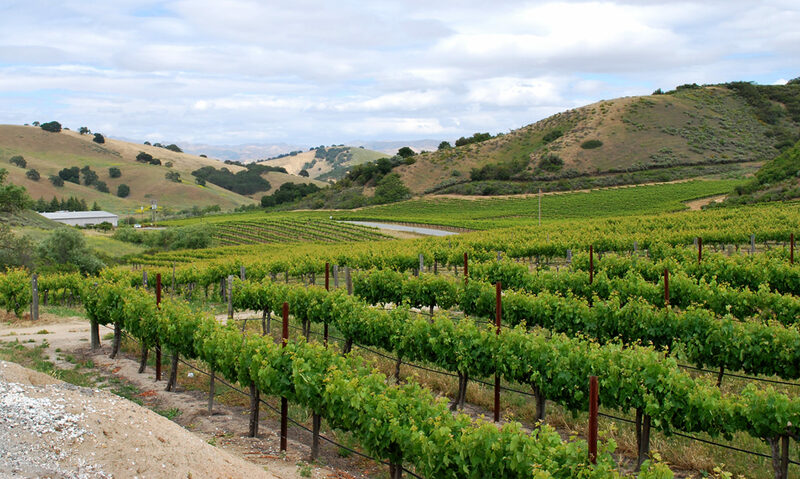 This channels cooler ocean air inland and results in a wide range of microclimates suitable for many different types of grapes. 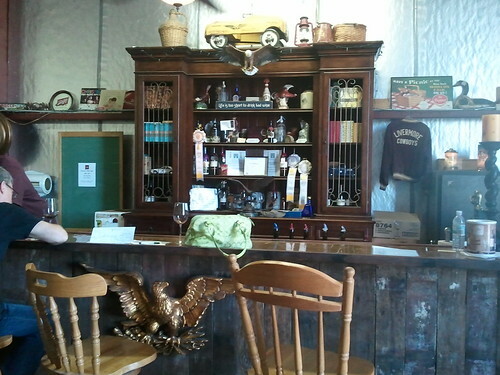 Dascomb’s tasting room had a classic feel, with a dark wood bar placed at a slight angle along one side, with a couple of additional seating clusters where visitors can enjoy their tastings while giving their feet a break. 2009 Pinot Gris: This mellow white had hints of saffron, citrus and a hint of oak. I also got a mild but definite hit of bleu cheese. 2008 Roussanne: The aroma of this wine was intriguing and complex. Nikki was reminded of incense. I found the scent to be bold, with toasty sugar elements and a hint of lipstick aroma. Nikki noted a kola flavor and I sensed an herbal overlay. I generally like Roussanne but usually find it not-terribly-complex. This one demonstrated that Roussanne can be more. 2005 Pinot Noir: I was delighted to get a strong scent of toasted marshmallow hovering over the fruit here. The flavor shows fruit in a lighter-bodied wine. Nice, gentle tannins finish the flavor. 2007 Sangiovese: Nikki’s notes say “Hint of port. Smells like the blood in The Vampire Lestat.” I have no idea what she means – I hope the blood in that novel smells like delicious wine. Says Nikki: If you’ve ever read the way Anne Rice describes blood from Louis or Lestat’s perspective in her Vampire Chronicles books, you know exactly what I mean. If not, smelling this Sangiovese to find out is probably faster than reading the books. There was an energetic ensemble of flavors evident here – blackberries and cream, a hint of tobacco and multiple fruits including cherries. It’s bright and acidic so it would be a great accompaniment to Italian food. 2003 Cabernet Sauvignon: Tasting this immediately put me in mind of chocolate covered cherries. Nikki was reminded of port. It’s bright with good acidity and light tannins. 2005 Cabernet Port: 100% cab port, fortified with triple-distilled wine brandy. Nikki’s super-sniffer got caramel, plum and toffee while I sensed chocolate covered raspberries in the aroma and flavor. After enjoying an actual chocolate covered raspberry offered by our pourer, the chocolate notes in the port emerged to the point that I could think of nothing else but a rich, dark, fresh chocolate souffle with raspberry sauce. It’s becoming a common refrain: This is an area that deserves a whole weekend from tasters. Solvang is a lovely town to stroll around and spend time in, the wine tasting is fabulous and abundant and the people are friendly. We’ll be back. The folks at Ripken had things figured out. 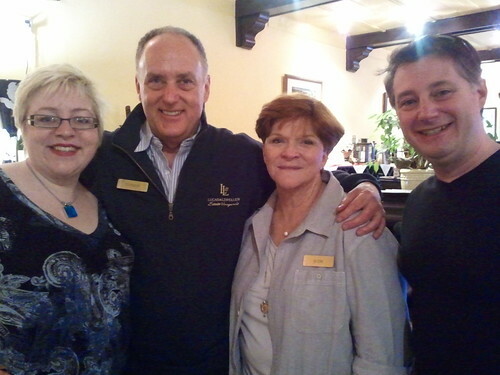 First of all, there was a theme – “PS – I Love You.” PS in this case stands for Petite Sirah, Ripken’s specialty. Second, they placed tasting stations all around the facility so that visitors could progress through their wines in a specific order. Despite these specific elements, the folks pouring and staffing the event were casual and easygoing, and seemed to be enjoying themselves and their guests quite a bit. The tasting route took us first around the right side of the building to a tasting table for the first set of wines. Next it was on to the back of the building where there were more tasting tables, guest seating and a fire pit. The concrete patio was thoroughly enscribbled with sidewalk chalk, which visitors were encouraged to use to express their own artistic impulses. We heard rumors of S’mores, but we were there late on the last day of the weekend and I think they had run out. Winery co-owner Richard Ripken was pouring at the table in back of the building, and he explained some of the issues and decisions grape growers and winemakers must consider in order to develop fruit with the specific flavor attributes they want. Richard’s admonition was to resist the temptation to water too early. Proceeding from the back around to the other side of the building we encountered a table full of silly wigs, hats and novelty sunglasses that Elton John would consider garish. We learned that this was not some perverse sobriety test – the props were actually for a photo booth the staff had set up. In exchange for your email address, Ripken would send you a link to a strip of four photos featuring you and your companions in crazy get-ups. I put on a wig resembling Slash’s hair (from Guns and Roses) and was told it was an improvement over the styling of my real hair. 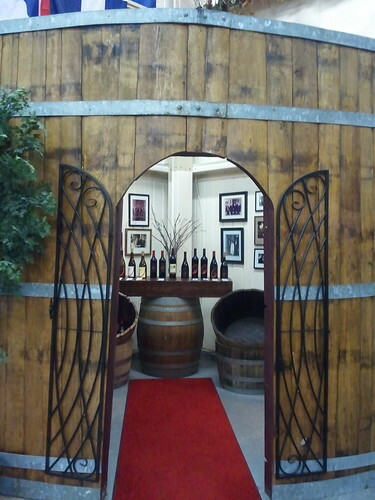 After photo fun it was on to the inside of the building to taste dessert wines. 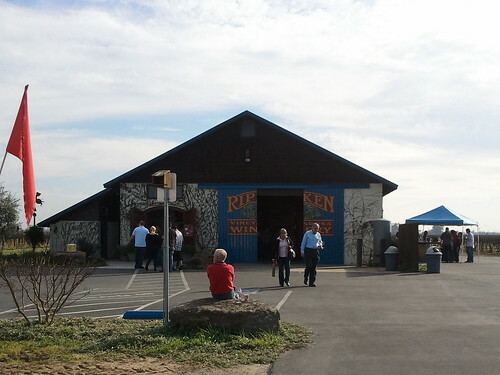 All the wines we tasted at Ripken were Petite Sirah except as noted. 2004 “Wedding Wine”: Fruity, jammy and warm with a taste of grape peel at the finish. Exuberant. Nikki says: I noticed a candied plum scent and a tangy plum taste. I also noticed that my adjectives seemed to have become limited to “prune,” “plum,” “candy” and “caramel” by this point in the day. 2005 “Wedding Wine”: Similar to the ’04 but with a hint of pepper and some cherry flavors. Nikki says: It seemed less harshly sour at the finish to me. 2004 “Rhonealicious”: Higher acidity made this lighter-bodied wine brighter, and the aclohol was more apparent. 2004 “Idyllwild Station”: I noted that it had a scent of raspberries, then when I reached for the glass for a second taste it was empty! I’m going to have to get Nikki to share her thoughts on this wine here. Nikki says: Ally my notebook says is “Chocolate coated plum scent.” On the bright side I’d found a fifth adjective; on the down side, I had no tasting notes. 2005 “Rhonealicious”: Definite notes of cherries and raspberries with a warm character. Nikki says: I tasted tart blackberries, like blackberries taste when they aren’t quite ripe. 2007 “Rhonealicious”: This wine is 5% Tannat and 5% Malbec. It’s jammy and fruity with berry flavors, and just enough spiciness on the finish. 2008 Petite Sirah: This double-gold winner was intense with fruit flavor, nicely balanced with the alcohol. 2008 Late Harvest Viognier Dessert Wine: A beautiful creamy mouthfeel. Grapefruit in the aroma but less so on the tongue. Rich, caramel-butter finish. Nikki says: My notes say “CANDY CANDY YUMMY CANDY! I WANT MORE!” As you may have noticed, I liked it. 2005 Port: Cherries, wood, alcohol and licorice make this a dessert wine that demands to be taken seriously.